Discover Epidaurus and Mycenae, ancient cities that were a melting pot of art and history, and the flavours of the authentic Greek cuisine. We cross the wonderful countryside of the Peloponnese to reach a Greek pearl: Epidaurus, a town in the region of Argolis that lies on the cool slopes of a valley covered with lush vegetation. It is likely that the town's founders, inspired by the idyllic location and their belief in the hidden virtues of plants and water, dedicated the area to Asclepius, the god of medicine, who according to legend could heal the sick and revive the dead. 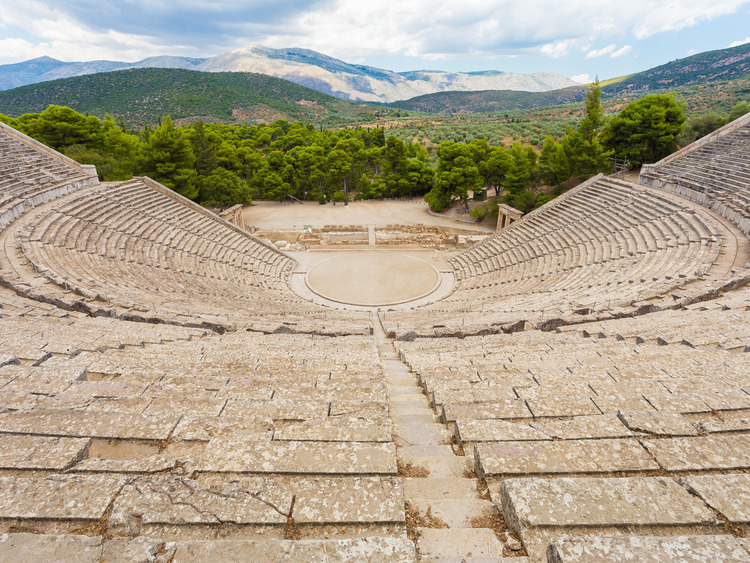 But Epidaurus is also famous for the wonderful theatre built here in the 4th century BC, which is renowned for its superb acoustics. Theatre performances are held in this beautiful setting even today. We continue by coach on to Mycenae, a city described by Homer as the "well-built Mycenae, rich in gold". Nestled in the foothills of Mount Zara and Mount Agios Ilias, the city surprises us with fascinating ruins that bear witness to the splendour of the past. The German archaeologist Schliemann conducted the first excavations in 1876. Searching obsessively for the tomb of Agamemnon, he discovered the Lion Gate, the main entrance to the city where the tombs of various ancient nobles were discovered. These contained a wealth of priceless grave goods and gold objects. The tomb of Atreus stands out among the most interesting tombs due to its unusual beehive shape. We succumb to the pleasures of the table, to restore body and mind, in a typical restaurant not far from Mycenae: a true delight for the palate and the mind!